The vote presents a vindication and a challenge to what the DNC calls its “most progressive platform” yet. The election buzz hovers over Philadelphia ahead of the Democratic National Convention, but for the workers greeting the delegates as they arrive at the Philadelphia International Airport, the important ballot has already been cast: They just voted overwhelmingly to authorize a strike during the event. Airport workers occupy the margins of Philadelphia’s service economy, powering the local and national infrastructure with poverty-wage jobs, on government-subsidized land. The potential strike the workers approved last week could affect about 1,000 service workers, including baggage handlers, cabin cleaners, security officers, and wheelchair attendants—who want decent, secure jobs in line with the airline industry’s soaring profits. The workers hope to steal some of the national spotlight on the convention hall by threatening a strike as they push for fair wages and union contracts, backed by SEIU’s nationwide airport-organizing campaign. In threatening to disrupt the convention, they’re rupturing a business model built on the exploitation of the city’s black working class. The workers and organizers are pushing back against the airline industry’s structural shift since the 1990s, away from solid unionized jobs—which are now concentrated in aviation professions like flight attendant—toward subcontracted precarious work controlled by third-party vendors rather than the airlines. The degraded working conditions at the airport—which community activist Reverend Greg Holston called “Philadelphia’s modern-day plantation”—reflects the post-recession trend toward unstable, subcontracted, non-union jobs across many fast-growing service industries. 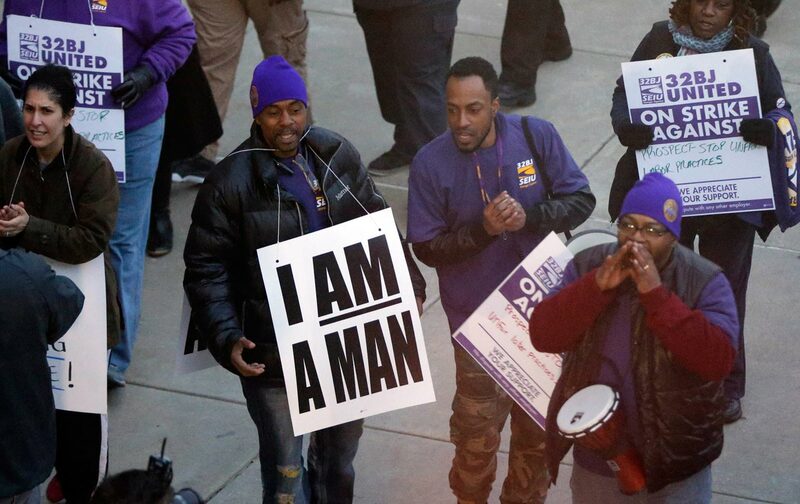 The week’s ongoing protests by Philadelphia’s airport workers, like other airport workers nationwide, represent an urban economy rife with segregation, and their struggle to uplift their working conditions face what the union calls systematic union-busting by “low-road” employers. According to a National Labor Relations Board complaint filed this week, subcontractor PrimeFlight Aviation Services, responding to organizing efforts, “coerced employees” by “informing employees that supporting [the union] would be futile for improving” their working conditions. Primeflight, alongside Prospect Air, even pressured them by offering promotions or bonuses in exchange for refraining from joining the strike. But the companies, which did not respond to requests for comment, ultimately failed to buy workers’ loyalty. The PrimeFlight workers join about 70,000 workers nationwide who have been mobilized through SEIU’s airport organizing efforts. A recent breakthrough came with the unionization of about 7,000 baggage handlers, security officers, custodial workers, customer service agents, and other subcontractor service workers in New York and New Jersey airports. Outside of formal unionization, 32BJ has pushed pro-labor policies through city government, including a landmark measure in 2014 providing airport workers a $12 minimum hourly wage, and a ballot measure for workers to earn paid sick days based cumulative hours worked. The reforms follow other citywide living wage policies aimed at improving the working conditions of subcontracted airport labor since the late 1990s, including airports in Los Angeles, Miami, San Francisco, and Syracuse. But workers have protested that the airport subcontractors are heel-dragging on implementation of the new policies. Only after mass protests last year did the companies begin fully implementing the new base wage. And the current battle for a further wage hike to $15 an hour also includes a more comprehensive paid-sick-day policy. Organizers say that bosses have repeatedly denied workers their entitled leave time by undercounting their hours, and sometimes disciplining workers for requesting leave. The strike vote presents a vindication and a challenge to what the DNC calls its “most progressive platform” yet. Though it is largely an aspirational document, the final draft reflects the core demands of the Fight for 15 movement, which was spearheaded by the SEIU three years ago. Whether or not they strike next week, the airport workers have proven they’re bent on holding politicians accountable to their campaign promises, just as they’re holding their bosses to the letter of the law. Conventions come and go, but the workers turning the tarmac into labor’s new battlefront will keep standing their ground well after politicians fly home.